Enjoy bread dipping as you would in the finest restaurants. Friendly. Informal. Delizioso. 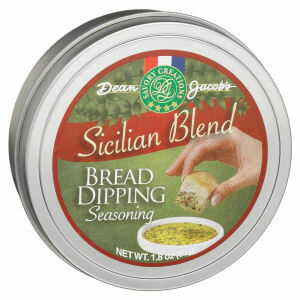 This tin contains Sicilian inspired herbs and spices. Blend with Cold Pressed Extra Virgin Olive Oil and enjoy or enhance the flavors of your favorite recipes. All natural. No preservatives. No irradiation. No MSG. 1.8 oz.